There are +925 million undernourished people in the world. At the same time, more than 1.6 billion are considered overweight or obese, many of whom suffer from conditions like diabetes and chronic heart disease. World food production could adequately feed all its inhabitants, yet there remains tremendous inequality in food access and distribution, a dichotomy between undernutrition and overnutrition. 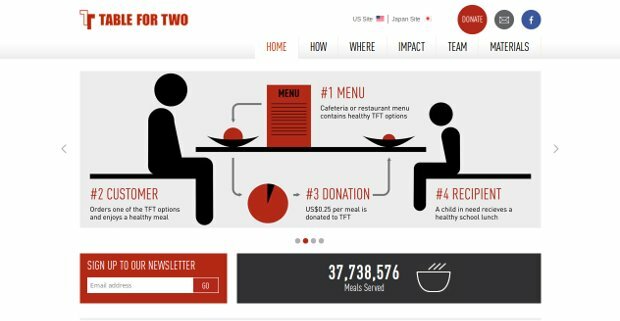 Table for2 (TFT), founded by Masa Kogure, addresses this global nutrition imbalance to benefit those suffering on both ends of the nutrition spectrum. TFT works with its partners to serve healthy, balanced meals to those in the developed world and transfer the excess calories to impoverished, undernourished children in the developing world, primarily in sub-Saharan Africa. Unlike other programmes that combat child under-nutrition, TFT does not just transfer donations from the developed world, but actively promotes and works towards better health and nutrition for those on both sides of the table. TFT works with 500 partners in the developed world in Japan, US, UK, Switzerland, India, Taiwan, Korea, and Hong Kong, including corporate cafeterias, university dining halls, governments, and public restaurants. Partners serve balanced meals to their clients and transfer US$ 0.25 per meal (the value of the excess calories) to TFT and its Millennium Village Project, which currently serves nearly 19.000 school children in Malawi, Ethiopia, Uganda, and Rwanda. TFT options are also sold in more than 400 convenience stores in Japan. The low-cost model designed by TFT has allowed for easier, widespread participation among those in the developed world, while TFT partners have found that raising meal prices for such a social cause has also garnered positive employee and student interest.